Build in a Collins glass, add crushed ice, and swizzle to mix and chill. 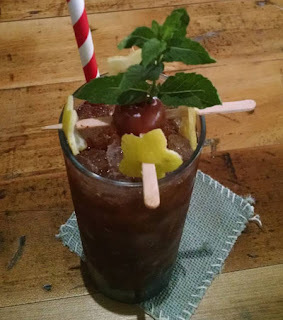 Float 1/2 oz Blandy's 5 Year Malmsey Madeira, add a straw, and garnish with a cherry, mint sprig, and lemon twists. (*) A 1 pound container of tamarind concentrate mixed with a short quart of sugar and a short quart of boiling water to make a final almost 2 quart volume. Probably a barspoon of concentrate mixed with 3/4 oz simple syrup (1:1) would work well (but integrate into the drink mix before adding ice). In thinking about drinks for Loyal Nine's Yacht Rock Sunday, I wanted to do a riff on the Don's Special Daiquiri. Instead of passion fruit syrup, I opted for a tamarind syrup that I made from concentrate paste that I sourced at a local Indian market. To stick with the exotic Far East feel, I switched the rum to Batavia Arrack, and ended up naming it the Eye of the Tiger which appears on the night's playlist. While the Special Daiquiri was served up, Dan of course pushed me towards a Swizzle direction with this one as I tinkered with the recipe as his shift drink earlier that week. The Swizzle format led me to the float of Madeira as well as the garnish grand eloquence (which did hurt a bit during one drink ticket burst). One technique I was experimenting with for a garnish was suspending the aromatic elements with toothpicks towards the top so that the bouquet stayed closer to the nose while sipping on the straw as opposed to sinking down with the ice level. Overall, the curious and intriguing acid twang of tamarind that makes Indian and Thai food sing worked rather well in this Special Daiquiri form.